As I gear up to enter the 2018 Nebraska Republican Primary for U.S. Senate, see here and here, I am focusing on what I consider to be the overwhelmingly most critical and urgent issue facing our country: our rapidly growing national debt, now 77% of GDP (for the public part on which we pay interest), and steadily getting much worse. 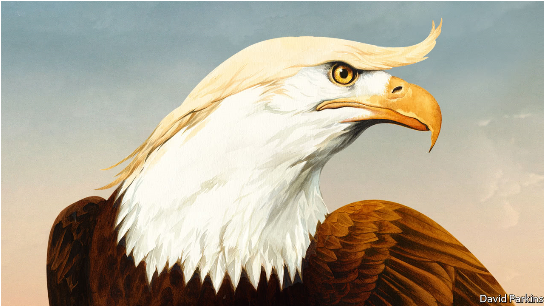 Nevertheless, just over a year ago an unexpected political earthquake shook the country as Donald Trump was elected President. As I become a candidate myself for national office, I need to make clear what I think about Mr. Trump. I will start out by saying that I did not vote for him because of his sleazy behavior towards women. I will try to be objective about his accomplishments in office, both positive and negative. He is standing tough on North Korea, working with the U.N., China and other Asian countries to impose strong sanctions on the North Korean economy. 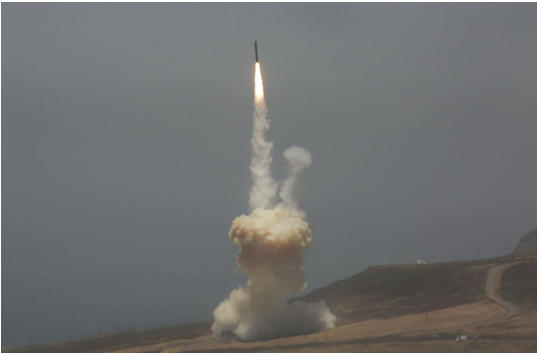 He is upgrading U.S. missile defense, as a smart precaution against a North Korean attack on the U.S. He has worked with many other countries to eliminate the ISIS physical caliphate. He has cajoled NATO members into contributing an additional $12 billion towards our collective security. The economy is now growing at a 3% annual rate thanks (at least in part) to his efforts at regulatory reform. The new tax law, which he signed, is likely to kick off higher inflation with the trillion dollar artificial stimulus from increased debt. This will lead to much higher interest rates which will make our huge debt far more costly. His noxious tweets undermine his presidency, by overshadowing his achievements. His personal popularity has dropped from 46% right after the election to 35% today. Conclusion. The best way for a member of Congress (or candidate for same) to respond to President Trump’s erratic behavior is by being objective, agreeing with him if possible and not hesitating to call him out when necessary. This is what I will try to do. Economic growth is a question of much political interest these days. Slow growth is a major reason why Donald Trump was elected President in 2016. The main justification for the Republican tax reform plan now moving through Congress is that it will speed up economic growth. World Population is likely to peak at about 9.2 billion in approximately 2075 and then start to decline. (See the Rational Optimist by Matt Ridley, page 206.) In country after country around the world, economic progress has already led to lower mortality rates which in turn have led to lower birth rates. This demographic process is likely to continue. Pollution is rapidly declining in the developed world (see above, page 279). Yes, greenhouse gas emissions (and global warming) are still increasing worldwide but the use of renewable energy is also increasing. 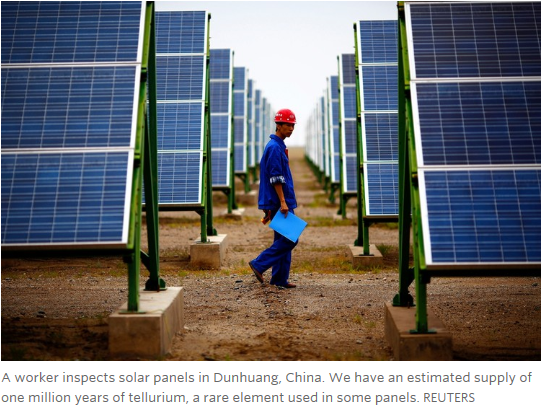 Furthermore, the U.S. and China, working together, easily have enough clout to enact a carbon tax, which would provide an economic incentive for industry to get carbon emissions under control. Natural Resources aren’t running out. Take phosphorous for example, which is vital to agricultural fertility. When the richest mines are depleted, there are extensive lower grade deposits still available. The fracking revolution means that oil and natural gas will be available for hundreds of years to come. The earth is finite, of course, but it is also a vast storehouse of resources. Conclusion. The economic growth that is needed to create more jobs and better paying jobs is compatible with maintaining a clean and stable environment on earth. 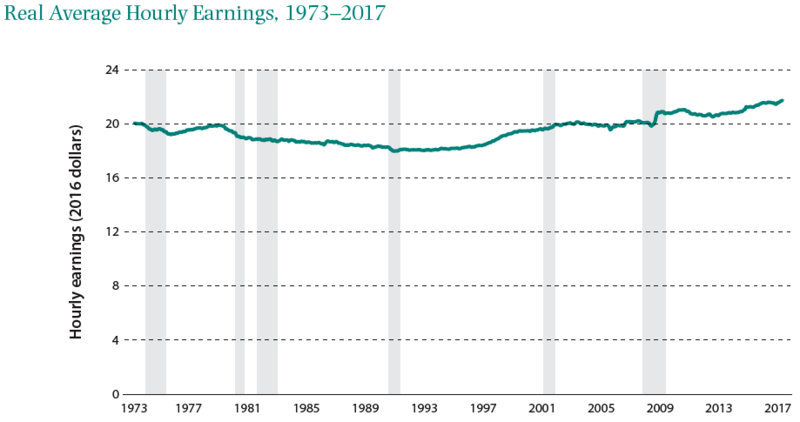 Tax levels in the U.S. have stayed relatively constant since 1965 while they have grown significantly in other O.E.C.D. countries. GDP, on the contrary, has been growing faster in the U.S. than it has in these same countries. Median wages, while growing more slowly in the U.S., are still much higher than in the other major O.E.C.D. countries. 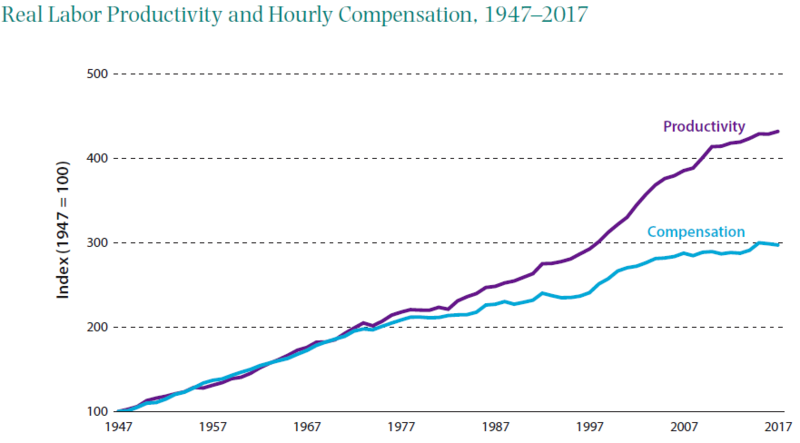 A new report from the Brookings Institute analyzes the factors which have contributed to relatively slow wage growth in the U.S.
Labor productivity has been growing faster than hourly compensation since the mid-1970s. 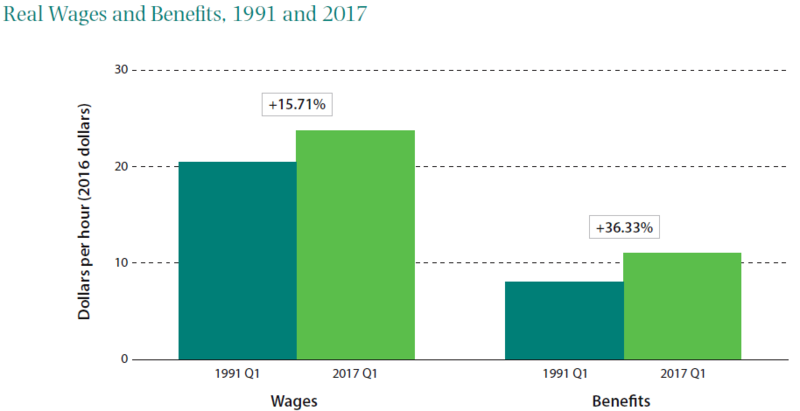 Benefits have grown much faster than wages in recent years. Labor’s share of income, compared to capital’s share, has been dropping in recent years. 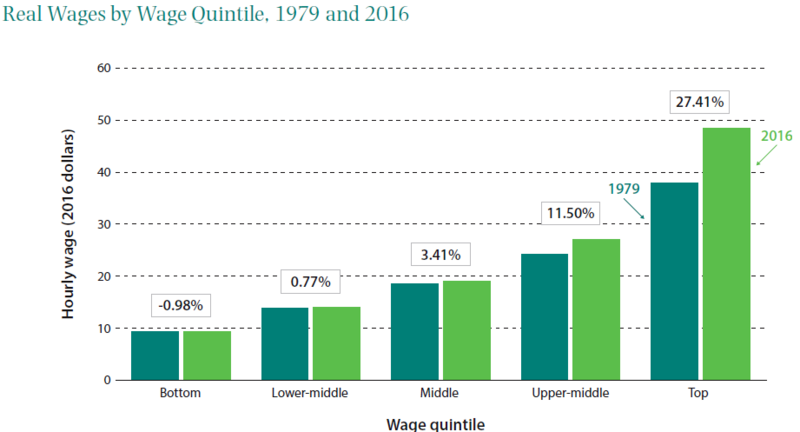 Wage gains have been greater in the higher wage quintiles. 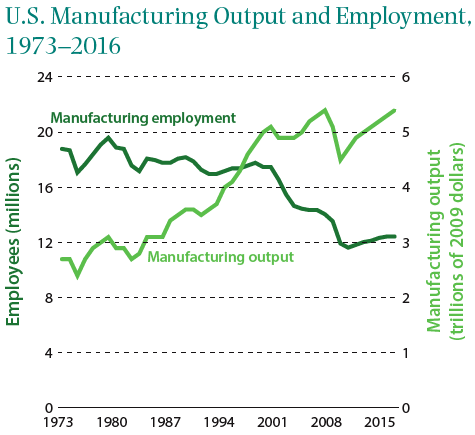 Domestic manufacturing output has increased even as manufacturing employment has decreased. Entrepreneurship (i.e. 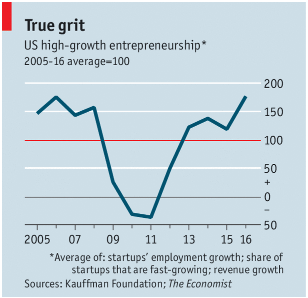 new business formation) has declined in recent years even though it may now be starting to pick up. Labor market slack has declined since the Great Recession though some still remains (measured as the share of the work force that works part time for economic reasons). Recent labor productivity growth has been especially slow, restraining wage growth. Conclusion. As everyone knows, slow wage growth is a highly contentious issue in the U.S. In addition to being a fundamental measure of a society’s wellbeing, it played a central role in the outcome of the 2016 Presidential election. 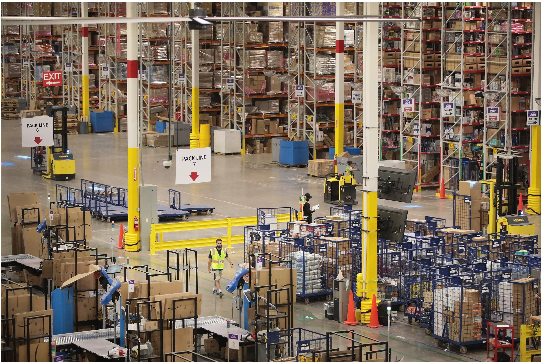 What can and should be done to speed up wage growth in the U.S.? Stay tuned!